Shopping for a new Ram 2500? If towing big loads are your thing, the Ram heavy duty’s optional rear air suspension will make life a lot easier and more convenient. The 2019 Ram 2500 and 3500 lineup is king (or queen) of the heavy-duty segment with its good looks, all the power, and incredible capability. 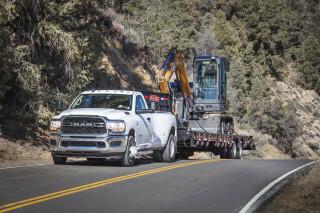 The 2019 Ram 2500 and 3500 Heavy Duty pickup trucks have the power and capability to tow nearly anything. The redesigned 2019 Ram heavy duty lineup not only moves the bar, it resets it for buyers who haul. For 2019, the Ram 2500 and 3500 lineup is new with larger grilles, LED lighting, more power, more gears, luxury-car technology and accommodations, and advanced safety tech. The 2019 Ram heavy duty lineup comes in Tradesman, Big Horn/Lone Star, SLT, Laramie, Power Wagon, Laramie Longhorn, and Limited trim levels with two engine choices paired to three transmissions, three cab configurations, two bed lengths, two drive options, and that’s before optional packages. Browsing the lineup is like reading a “Choose Your Own Adventure” book. Step back and consider the Ram heavy duty’s sizable range before buying one. These trucks’ abilities are not for the faint of heart, and neither are their tremendous options. The front of the latest Ram 2500 and 3500 is a 39-inch wide grille. The chiseled snout stands in contrast to a big-rig design that has otherwise been toned down and smoothed out. Inside, these big trucks can be spartan for work duty with a vinyl floor and crank windows in Ram heavy duty Tradesman trim; to luxurious with soft-touch materials, leather-wrapped dashboard, and a 12.0-inch touchscreen in top-tier Limiteds. More capable than ever in the right configuration, the Ram heavy duty can tow up to 35,100 pounds. A 6.4-liter V-8 with 410 horsepower and 8-speed automatic transmission is now the base powertrain, but buyers are more likely to opt for the 6.7-liter turbodiesel inline-6 with up to 1,000 pound-feet of torque. So equipped, there are few things this truck can’t haul down the road, and the Power Wagon stands ready for when the road disintegrates. Once relegated to the fields and work sites, the Ram lineup is increasingly a tool for family use and more casual weekend hauling. Ram took the big-rig exterior and swanky interior from its light-duty truck and brought them up to the heavy duty league. That’s a win. The 2019 Ram Heavy Duty is a super-sized version of the Ram 1500. The grille, wheel designs, and headlights are upsized to match the heavy duty’s increased capability, but the look is the same. Each trim takes on its own theme. Tradesman trucks have unpainted bits and steel wheels—the basics for a work truck. Ram heavy duty Big Horns (sold in Texas as Lone Stars) add chrome bumpers and wheels. Ram heavy duty Laramie trucks swap the chrome wheels for aluminum and have LED lights. Power Wagons are the odd duck of the lineup with 17-inch aluminum wheels wrapped in knobby 33-inch Goodyear Wrangler DuraTrac tires, powder-coated bumpers, a black grille, and a Warn winch mounted in the front bumper. Power Wagons tower over NBA stars with their suspension lift kits. Laramie Longhorn and Limited trims are the trucks with class, although they take two distinct approaches. As its name implies, the Ram heavy duty Longhorn is a western take on luxury with its available two-tone paint, while the Limited is a city slicker that looks best in tuxedo black. Inside, the Ram 2500 and 3500 are dead-ringers for the smaller Ram 1500 truck. The same vertical 12.0-inch touchscreen that is available in the 1500 can be had in the big trucks, for a price. The dashboard features conventional buttons and knobs for main controls regardless of touchscreen size, and upper trim trucks are slathered in leather, soft touch materials, real wood, metal, and solid plastics. The Ram heavy duty lineup offers has all the torque and then some. The base engine in the Ram 2500 and 3500 is a 6.4-liter gas-powered V-8 with 410 hp and 429 lb-ft of torque. Cylinder deactivation can shut down four cylinders under light loads to save fuel, although these trucks are heavy enough that they aren’t rated by the EPA. The engine comes hooked to an 8-speed automatic transmission that makes better use of the power and torque than the previous 6-speed. For day-to-day situations, there’s more than enough torque out of the big 6.4-liter to motivate the massive amount of metal down the road or trail. Under strong acceleration, the thunder from under the hood and the exhaust is muscle-car grade. Our experience with the 6.4-liter V-8 has been limited to the Power Wagon with its chunky 33-inch tires and off-road suspension. On the trails, the torque propels the truck to climb steep rock faces with a throttle that is easy to modulate. Our limited on-road experience showed how much smoother the 8-speed transmission is than the outgoing 6-speed. 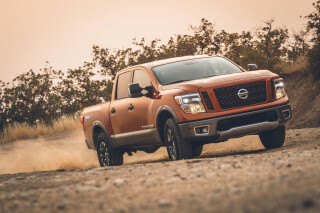 The Power Wagon has its core strengths in off-road gear with front and rear lockers, lifted suspension, and an electronic disconnecting sway bar for more articulation on the trails. Those with grand towing ambitions will opt for the available 6.7-liter inline-6 Cummins turbodiesel engine. In standard guise, the turbodiesel turns out 370 hp and 850 lb-ft of torque. Those needing more power can opt for the high-output version in the 3500 that spins those numbers up to 400 hp and 1,000 lb-ft. The standard output engine hooks to a 6-speed automatic transmission while the high-output engine uses a beefier 6-speed automatic. Notably, the torque isn’t limited in any gear. Both engines provide more than enough power for heavy loads, but the heavy duty’s 35,100-pound maximum tow rating applies to the high-output turbodiesel and a specific cab and bed configuration. Both turbodiesel engines are smooth with clean shifts from their automatic transmissions. Power comes on strong off the line and feels like it’s drawn from a bottomless well. We hooked a Ram 3500 dually to a 14,900-pound trailer and found the high-output barely phased by the load. Towing 31,500 pounds—the maximum rating for a certain configuration we drove—up a 6-percent grade revealed this engine’s strength. The Ram heavy duty lineup’s rear suspension varies. Ram 2500s have coil springs tied to their solid axle, which clobbers expansion joints with relative grace—at least for a massive truck. The beefier Ram 3500s swap the rear coils for more traditional leaf springs to boost towing and payload capability. A rear air suspension is available to help level loads and make hooking up a trailer easier. Whether it’s loaded up with 14,900 or 31,500 pounds, the Ram 3500 dually we drove was easy to control and instilled confidence behind the wheel at highway speeds. 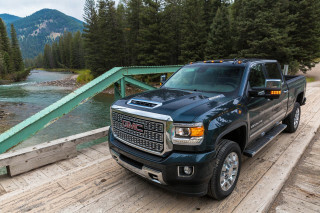 These trucks ride and handle far better than most buyers will expect. Regardless of trim level, the 2019 Ram heavy duty is quiet, spacious, and refined. Ram offers the heavy-duty lineup with two bed lengths and three cab configurations. Regular cab models only come with an 8-foot bed, while four-door crew-cab trucks can be had with an 8-foot or 6-foot-4-inch bed. The massive Mega Cab, with its sprawl-out back seat, comes only with a 6-foot-4 bed. Ram offers a deployable bed step mounted under the rear of the truck that swings down and out, but it isn’t nearly as useful or innovative as the solutions offered by Chevrolet, GMC, and Ford. LED bed lighting, spray-in bedliner, and creative Rambox bed fender storage wells are all on the options list, as is a bed divider and cargo rail system with four movable cleats. All Ram heavy duty models are noticeably quieter inside and out than before thanks to active noise cancellation, anti-vibration devices, and acoustic glass. Even a regular cab Tradesman truck hooked to a 31,500-pound trailer headed up a 6-percent grade was surprisingly quiet. Fit and finish is impressive even in base Tradesman form, while high-zoot models feature leather-wrapped dashboards and hand-stitched leather grab handle covers. Even the volume button operates smoothly, like melted butter. The lack of a telescoping steering wheel is a surprising omission, although the optional power-adjustable pedals help some. Most buyers will opt for the four-door, crew-cab body. It’s massive, and it’s not even the largest cab offered. There’s plenty of room for five full-size adults, or six if the front bench seat is optioned. There’s oodles of storage for maps (if you still use those), tools, and gear. High-zoot Limiteds feature heated seats front and back with cooled seats up front. The leather and wood steering wheel is heated as well. The Ram can take over SUV duty for a family with its spacious rear seat. There’s underseat storage for valuables, two gloveboxes, and a Swiss-Army center console with 12 different configurations. The 2019 Ram heavy duty lineup finally has some advanced safety tech. Neither federal nor independent crash-test agencies have slammed a 2019 Ram heavy duty against a wall. That might be a good thing in the wall’s case, but we can’t assign a score here. For 2019, the Ram heavy duty lineup has six airbags, stability control, traction control, and anti-lock brakes, and a rearview camera. An optional cargo camera and surround-view camera systems make loading, hauling, and navigating easier. Limited trims feature blind-spot monitors that are optional on the rest of the lineup. Active safety tech such as forward-collision alerts with automatic emergency braking is available throughout the lineup and the tech also functions while towing. Parking sensors are available in lower trim models, while parking sensors with parking assistance is available on upper trims. The Ram heavy duty lineup has a truck for every man or woman with a long list of safety and tech options. The depth and range of the 2019 Ram 2500 and 3500 Heavy Duty lineup knows almost no bounds with a configuration for every use and every buyer. The lineup includes Tradesman, Big Horn/Lone Star, Power Wagon, Laramie, Laramie Longhorn, and Limited trims. A simple breakout of the lineup buckets the Ram heavy duty into work trucks, off-road trucks, and luxury trucks. Basic work trucks offer more thrills than expected, but are meant to get dirty daily without flinching. All Rams have tech baked in with even more available, but megabuck Limited trucks feature a 12.0-inch touchscreen unmatched by the competition. A work truck will cost at least $40,000 with a few options, while a loaded-up Limited dually with four-wheel drive costs $80,000. The Ram 2500 and 3500 Tradesman is aptly named and can be configured with a standard cab and 8-foot bed or as a crew cab with either a 6-foot-4-inch or 8-foot bed. Tradesman trucks come standard with vinyl floor, manual windows and locks, keyless ignition, 5.0-inch touchscreen for infotainment, Bluetooth, trailer hitch, air conditioning, and steel wheels. 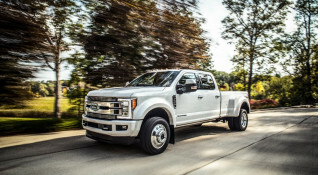 Option packages can add everything from active safety tech to cloth upholstery to a rear air suspension, and even the Power Wagon off-road package. One step up the trim ladder, the Big Horn model (Lone Star in Texas) ups the ante with power towing mirrors, integrated brake controller, 18-inch chrome-clad wheels along with chrome bumpers and door handles. The Big Horn trim can be equipped with an 8.4-inch touchscreen for infotainment with built-in navigation, Apple CarPlay and Android Auto compatibility, parking sensors, heated front seats and steering wheel, LED lights, and a number of appearance packages. Ready for adventure is the Power Wagon with its 17-inch aluminum wheels wrapped in 33-inch Wrangler DuraTrac off-road tires, LED lighting, Warn winch, electronic locking front and rear differentials, Bilstein shocks, powder-coated bumpers, and flashy graphics. Big work trucks can pamper, too. The Ram Laramie brings 18-inch wheels, leather upholstery, and an upsized infotainment screen. The Laramie Longhorn has a western vibe with soft leather and real wood inside that’s branded like a steer. The Limited adds the 12.0-inch touchscreen that’s optional on some trims plus a tonier appearance with even more chrome. Inside, the Ram can keep all the devices charged with up to five USB ports and four type-C ports for fast-charging. Power on the go can also be provided by up a trio of household-style 115-volt outlets that can handle up to 400-watts of charge inside the cab. A fourth can be optioned in the Rambox. 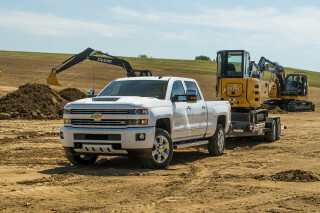 Heavy duty pickups escape the EPA’s calculators. Despite our objections, federal testers don’t rate heavy-duty pickup trucks like the 2019 Ram 2500 and 3500 for fuel economy. Heavy-duty pickups aren’t just for work detail, they’re increasingly turned into family haulers, evidenced by the number of luxury trims available for the Ram heavy duty. Considering their wide ranges of use, it’s hard to predict what owners should expect from the 2019 Ram heavy duty range’s fuel economy, but low-teens is a safe bet.